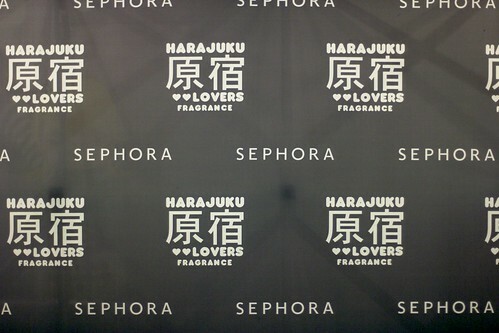 It might have been over two weeks ago, but I’m still giddy about my Fashion’s Night Out experience at Sephora Soho. I never would have guessed I’d be spending the second FNO doing virtually the same thing I did on the first! 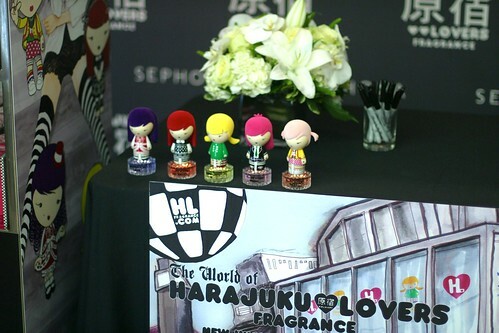 Once I heard Gwen Stefani would be at Sephora signing her five new Harajuku Lovers perfumes, all previous plans were canceled. When I arrived at Sephora to purchase my perfume that morning at 9:40am, I estimated that I was already about 60th in line. 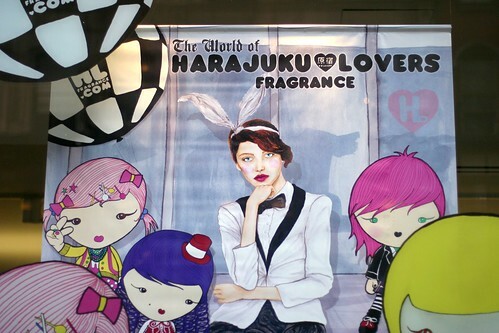 Luckily, my guess was correct, and I was able to purchase two of the Harajuku Lovers perfumes and get a wristband for the signing. I returned to Sephora about an hour before Gwen was due to arrive. Thankfully, I’d also been confirmed for press access for the blog, so I was able to set up in the photographer’s area while we all waited for Gwen. The line for the signing already stretched to the back of the store, and what seemed like a few hundred onlookers crowded around Sephora’s windows waiting to catch a glimpse of Gwen. It was nearly impossible for late arrivals to get inside! I heard a few anxious discussions about fans outside possible breaking the glass. 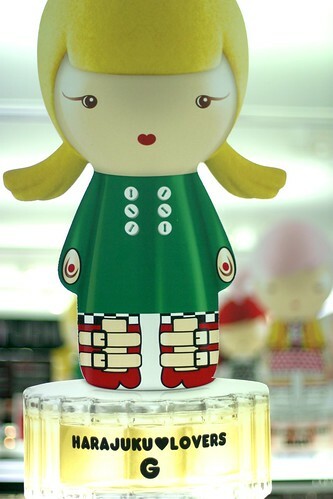 It freaked out quite a few of us inside the store. Onlookers practically smashed against the front doors. The perfumes! They all smelled so good. Looking gorgeous, as usual. 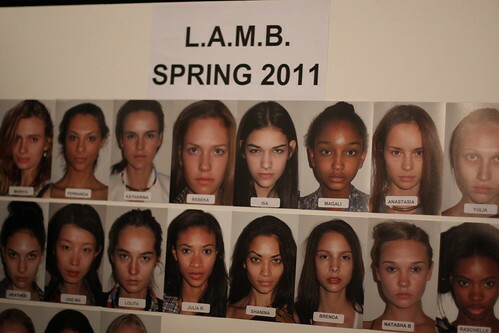 In Spring 2011 L.A.M.B. 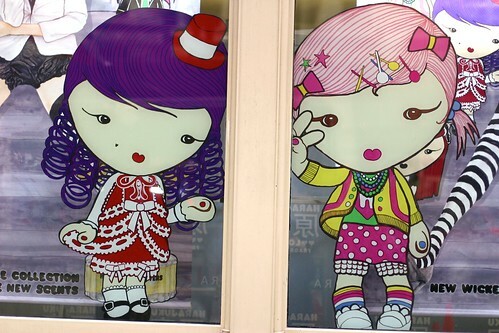 They nearly started a riot after Gwen appeared in the windows. I hear people were jumping on top of cars, and the entire block of Broadway in front of Sephora was impassable. 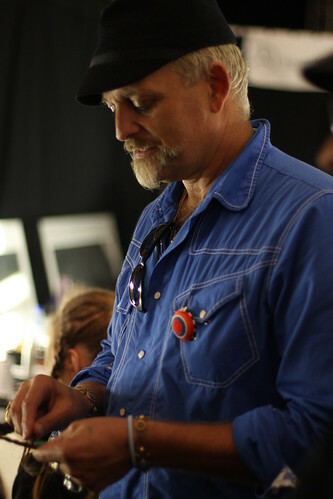 Grabbing the perfumes for another photo op. My friend Veronica had been holding my spot in line while I finished my press coverage. 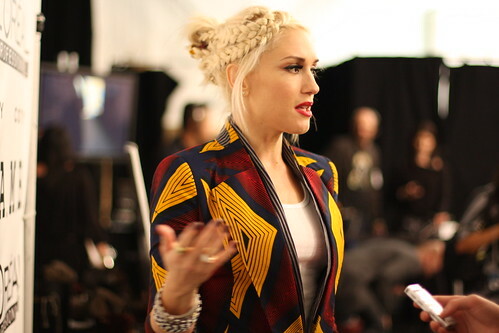 Once the signing started, I hopped over, and we waited to meet Gwen. Gwen signing for the woman in front of me. 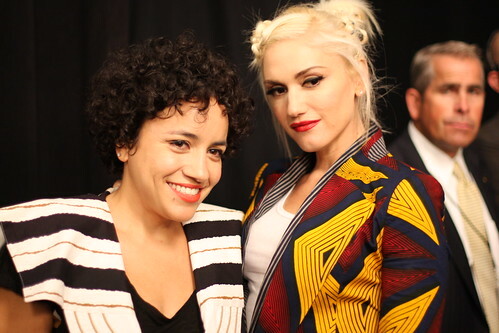 Even though I met Gwen last year, I was nervous. She’s pretty much the only celebrity I actually consider a role model and an inspiration. Thankfully, she’s also hands down one of the nicest people I’ve ever met. She just radiates kindness. While she was signing my perfume, we had a chance to quickly talk about me meeting her at the last FNO (Gwen said I looked familiar! ), and I gave Gwen one of my moo business cards with her photo from a 2002 No Doubt show. She said she’d check out the photos, because she loves to see what fans shoot. She also signed a 5×7 copy of the same photo for me after I told her it’s one of my favorite photos I’ve ever shot. We talked so much, eventually a security guard told me it was time to go! 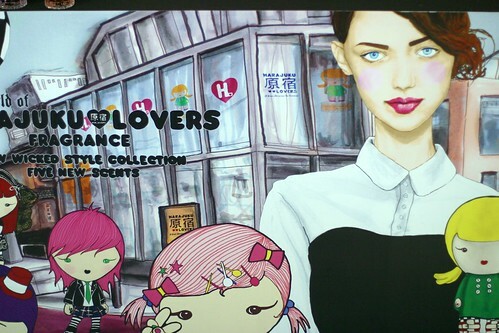 I feel very lucky that I had a chance to chat with Gwen again, and get my new “G” Harajuku Lovers perfume signed! The little felt-head bottles are absolutely adorable. I went home with G and Love (which smells a lot like grapes!). I can’t wait until the rest of the collection hits Sephora stores in November. I think I might have to buy them all! Thanks so much to Gwen, Sephora, and Coty for hosting this amazing event! 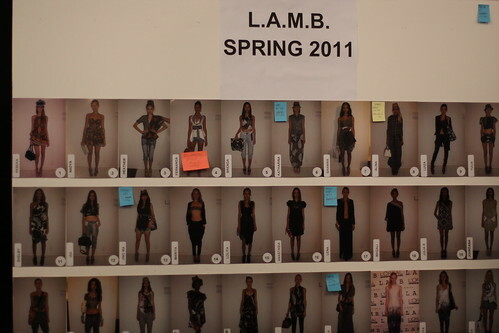 Arriving backstage at L.A.M.B, I was immediately thrust right into the middle of a fashion frenzy. Models had colorful extensions braided into their hair, manicurists roamed the floor painting nails, and tailors worked speedily on touching up a last minute dress. 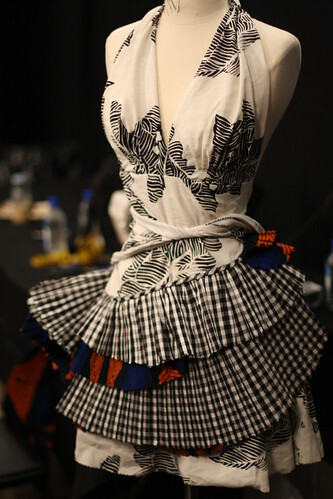 The season’s “African Dance Hall” inspired theme was complimented by every last detail of the models look. Beautiful dark navy nails brought out the blues in much of the clothing. Nails by Angie Wingle for CND. Nails were painted in a custom-mixed shade of dark blue. Colors used were CND’s Inkwell, Studio White, Speedy, and Anchor. 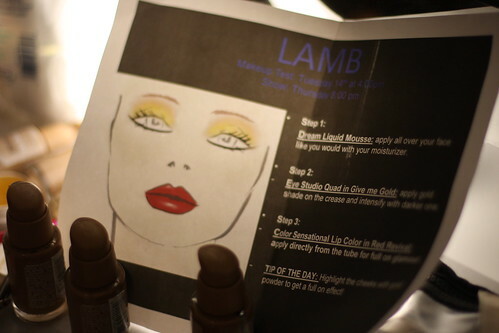 A similar color is set to launch as part of CND’s Fall 2011 collection. 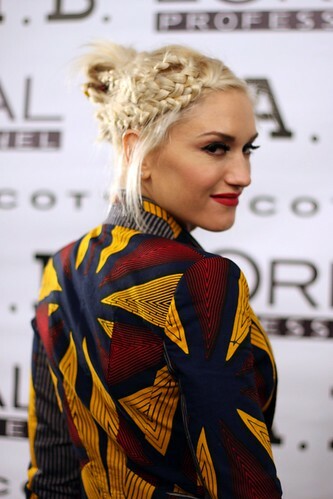 Hair was styled in elaborate masses of long braids, inspired by Stefani’s recent red carpet looks, and multi-ethnic traditional hair styles. 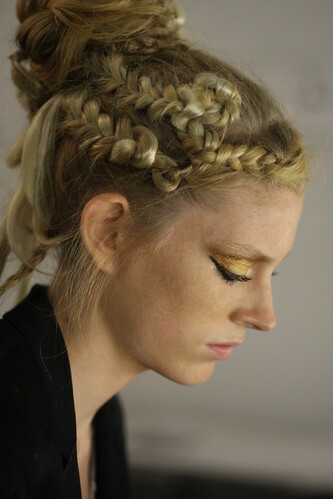 Lead stylist Danilo, for L’Oréal Professionnel used clip in braids in contrasting colors to create the look. 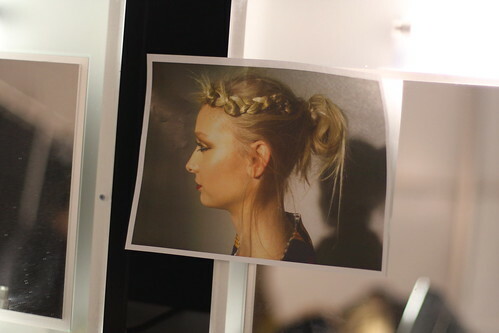 Density Spray was used to mold the extensions, which were pulled back into an asymmetrical pony tail. 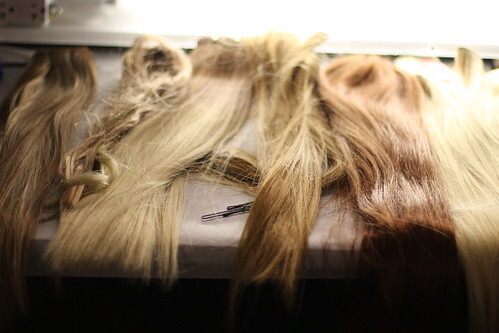 Hair extensions, colored with Inoa color by L’Oreal Professionnel. Eyes: Eye Shadow Quad in Give Me Gold. 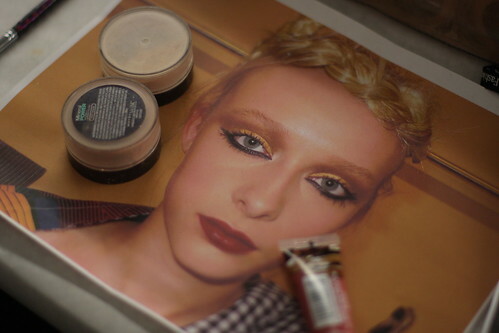 Gold shadow was applied to the crease. (Also used to highlight inner corners, brow bones, and tops of cheekbones.) 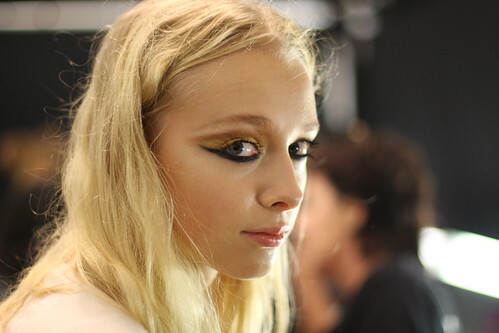 Copper shadow was used on the crease, extending out into a cat’s eye shape. Yellow shadow was swept over the entire lid. Followed by black liner under lower lashes, also creating a cat’s eye. The look was finished with multiple coats of Falsies mascara. Lips: Tempting Toffee Lipgloss #55 for a pink look. And Deep Red Lipstick #645 for a more dramatic lip. 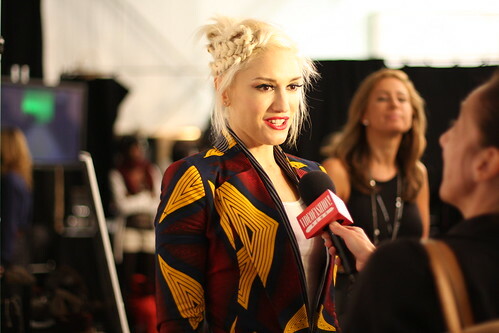 As models were prepped, Gwen gave interviews and discussed her inspiration for this season’s collection. 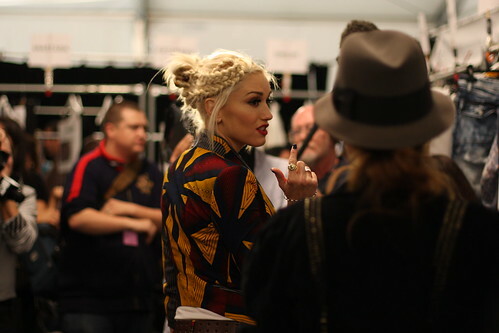 Gwen taking one last look at the collection before the show. 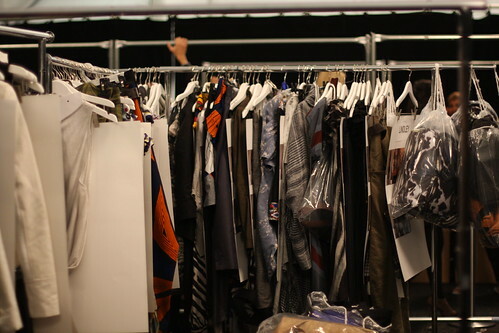 See photos from the runway here. 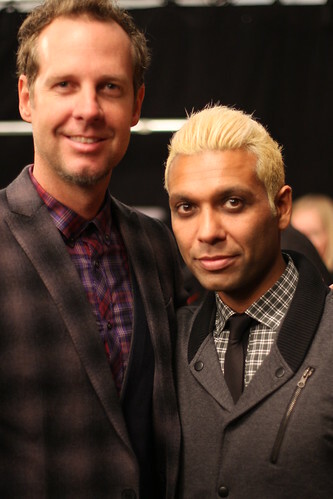 Tom Dumont and Tony Kanal. 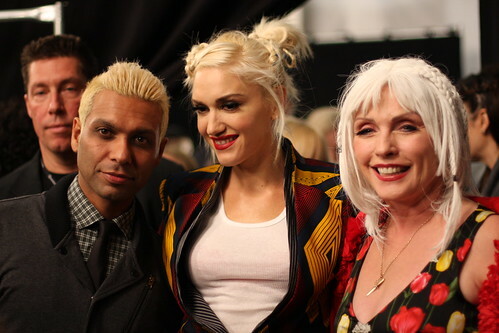 Tony, Gwen, and Debbie Harry. 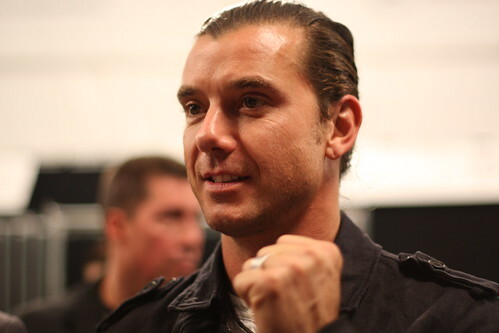 See the full photo set from backstage here. 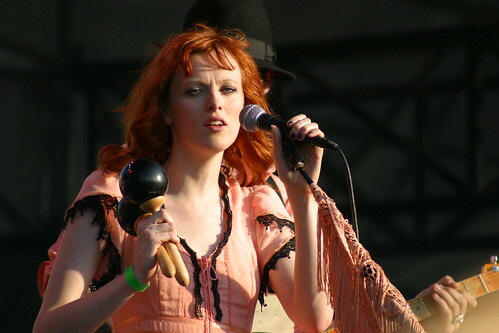 Sunday night, I braved the intense summer heat and headed down to the Williamsburg waterfront to see Karen Elson, Grizzly Bear, and Band of Horses. I arrived a bit late, coming back to the city after a weekend in Connecticut. 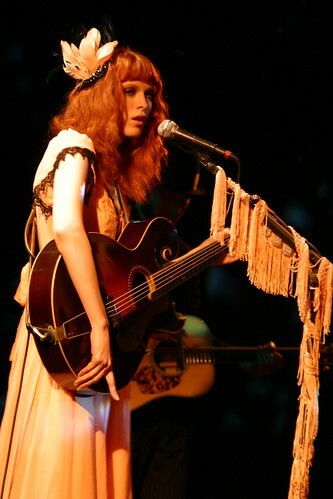 But luckily, Karen Elson was still on stage. 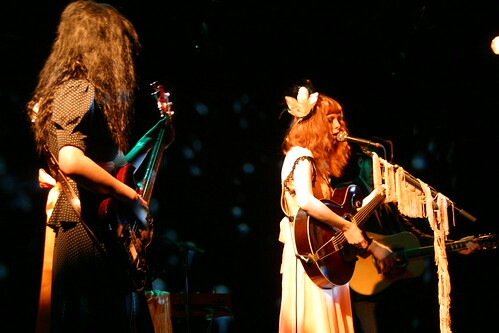 Looking and sounding gorgeous as always, Karen and her band members dressed in coordinated in peach and black outfits. I can’t get enough of Karen’s debut CD! She seemed to win over quite a few new fans in Sunday night’s audience as well. I didn’t photograph Grizzly Bear’s set. Maybe it’s because I was far back from the stage in the “drinking area” with my friends who wanted beer… but Grizzly Bear didn’t capture my attention as much as I’d expected. Live, they sounded almost exactly like they do on CD. Their set seemed more like an intermission between the sultry and folksy Karen, and more animated stage performance of BOH. 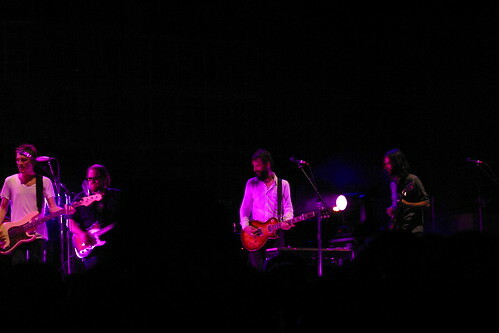 Band of Horses went on stage right as the sun started setting. The heat, the sunset, and cool breeze coming off the east river aligned to create the perfect conditions for of the start of the summer concert season. 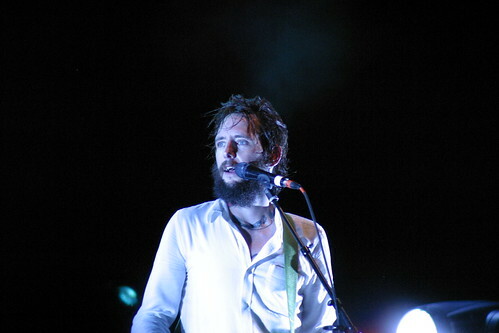 Band of Horses blew me away. I love them even more after seeing them live! They’re one of those rare live acts that despite having quite a few members, have a sound that flows together with each musicians contributions meshing together perfectly. They also came across as genuinely fun guys, who loved performing and interacting with their fans, rather than just being on stage and doing their jobs. The highlight of the night had to be an overeager fan–Andrew, who repeatedly screamed and yelled trying to get the band’s attention, and eventually tried to jump on stage. 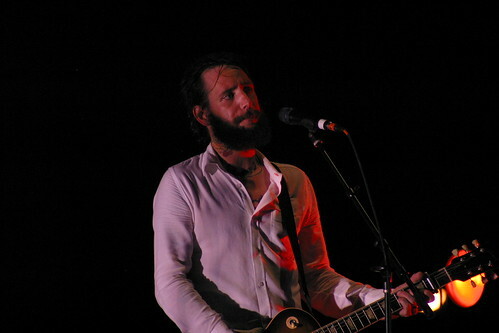 Rather than freaking out, lead singer Ben Bridwell serenaded Andrew, and worked his name into multiple songs. I really hope some enterprising fan got the whole thing on video. It was truly hilarious. The show was the perfect kick off event for a summer season of concerts at the Williamsburg waterfront. Quite a few great concerts are scheduled here. And look for the lineup of Jelly NYC‘s “Pool Party” free shows at the waterfront to be announced soon! Read a great, more in depth review of the show here. I’ve been working on an epic street style post for a while now. 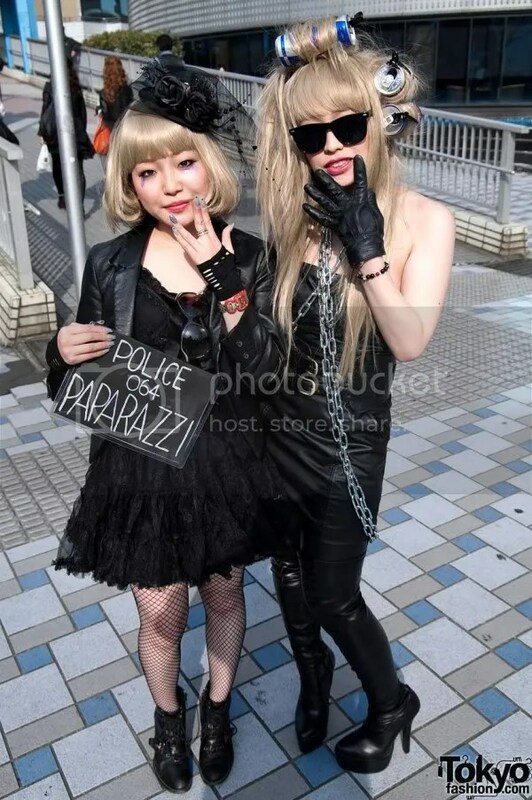 One of the best things I came across while doing my research has to be these photos of Japanese Lady Gaga fans attending her two sold out Tokyo shows. I posted about the photos on twitter last week, but couldn’t resist showcasing more of the outfits. The attention to detail and variety of costumes is amazing! 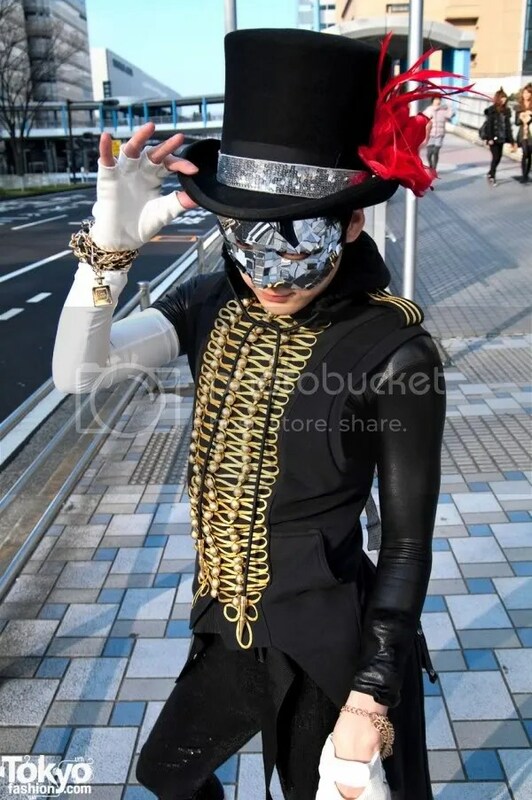 People of all ages and sexes dressed up as Gaga in her many incarnations–and there is even one Beyonce! I didn’t see anything like this at the NYC show I attended. Look at this little guy! Take a look at the original posts for even more images. It’s really worth it, just to see the detail in the larger images. 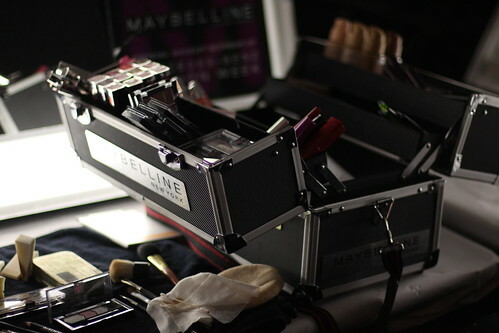 Everything from the makeup, to hair accessories, to fingernails is impeccably done. 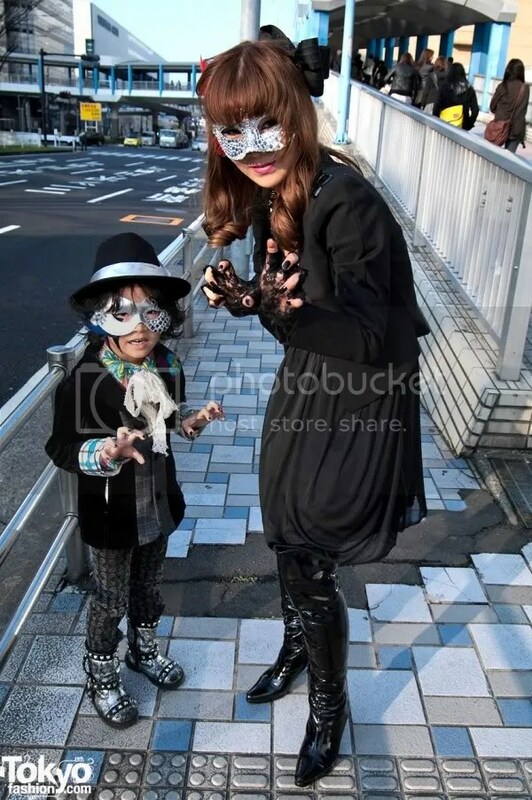 All photos via Tokyofashion.com here and here. 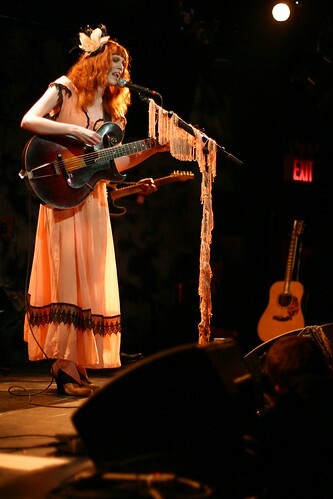 Last night I braved the torrential rain storm to see model and musician Karen Elson’s first NYC show at Le Poisson Rouge. Karen’s first solo show just took place this past week at SXSW in Austin, so I feel extraordinarily lucky I was able to catch her sold out debut performance in New York City. Le Poisson Rouge was the perfect venue for the occasion. Small and intimate, but still arranged in a way that all guests can comfortably watch the show. I arrived early enough to snag a front row seat (at a table with a handful of strangers). I was especially glad I was early after watching dozens of guests, including a few people I recognized like Liz from White Lightning, and Mr. Mickey from PAPER Magazine arrive too late to find seating. Not with out seats: Grace Coddington with beau Didier Malige, and half a dozen other VOGUE staffers with front row center seats reserved just for them, there to support their friend. Total side note, but Grace, who was sitting about 10 feet directly in front of me, kept making eye contact with me. (Which made me totally giddy.) At one point, she was right behind me talking to a friend. Grace remarked how skinny her friend looked, to which the woman replied “no fat, no dairy, no sugar.” Grace immediately responded with “fat, dairy, sugar” while patting her stomach. Just another reason I love this amazing woman. Once the show started, I had the perfect vantage point for both watching, and taking photos. Not surprisingly, Karen seemed a wee bit nervous on stage. 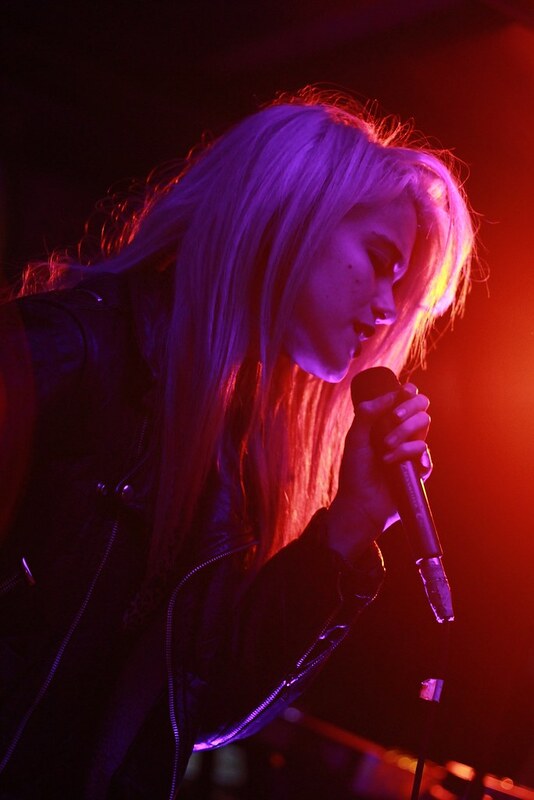 But once she began to sing, all signs of nerves disappeared. And boy, the woman can sing! 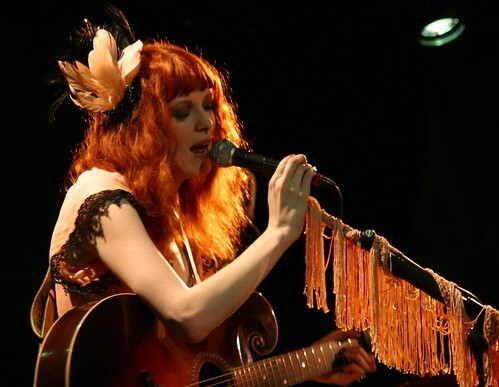 Sounding like the lovechild of Patsy Cline and a modern singer like Jenny Lewis, Karen belted out over a dozen songs for a completely enthralled audience. Even more beautiful in person, Karen also possesses one of the cutest speaking voices I’ve ever heard–a sweet sounding British accent watered down with a bit of American twang. 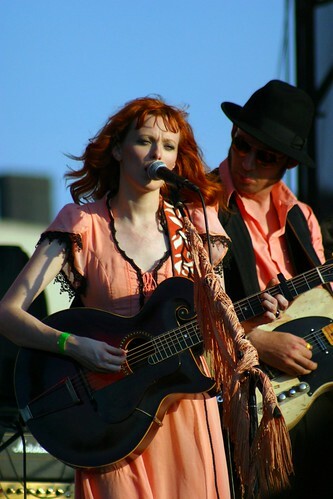 But her voice isn’t her only gift: she’s an extremely talented songwriter with a penchant for great “story telling” songs reminiscent of Johnny Cash, Bob Dylan, and Simon and Garfunkle. 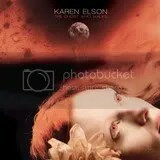 Karen’s debut album, is set to be released May 25th by Third Man/XL Records. For more info check out her web site. 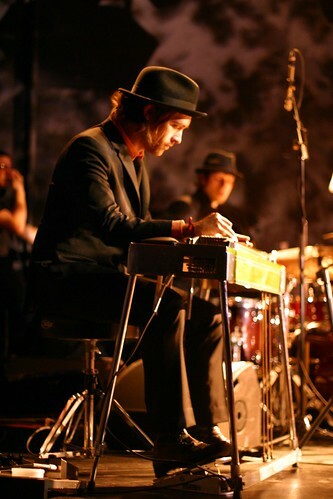 If you sign up for the mailing list, you receive a free mp3 of “The Ghost Who Walks”! 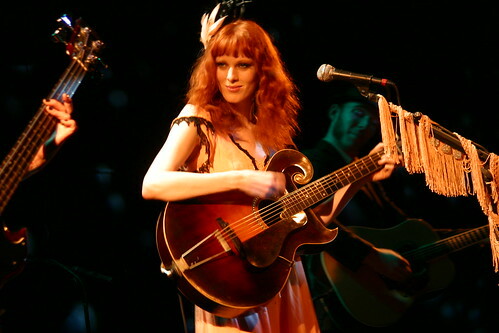 No word yet on when Karen will be back in NYC, but I’ll be anxiously awaiting another chance to see her live! 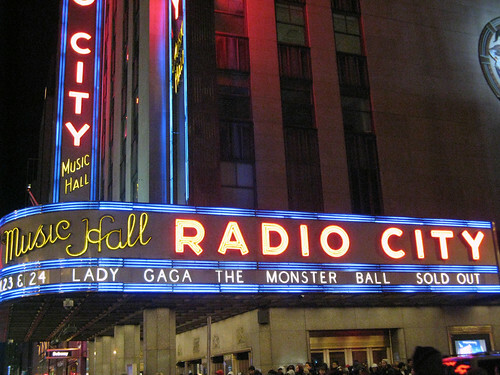 This past Saturday night, I saw Lady Gaga’s amazing sold out show at Radio City Music Hall in New York. I’ve been to nearly two hundred concerts over the last fifteen years, and this show definitely earned a ranking in the top five. The sets and lights were phenomenal, as was Gaga’s stage presence. She managed to engage the entire audience and made it feel more like an intimate night club than Radio City. She played all of her best songs (except Telephone!! 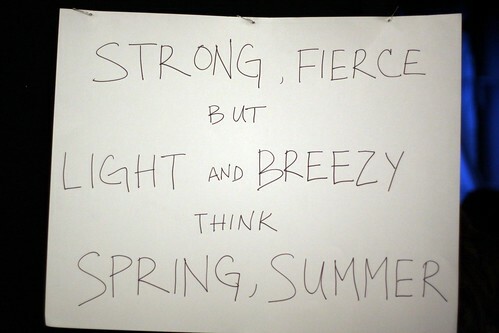 ), including “Poker Face” both acoustically and normal. 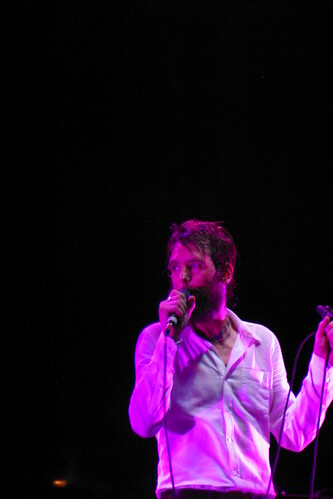 The only downside of the entire night: I was seated somewhat far back and was stuck using a digicam instead of my DSLR. Everyone there was taking pictures, so I probably could have got away with sneaking it in, but didn’t want to risk it. But I think I still got some great (albeit grainy and sometimes pixelated) shots of Gaga and her fabulous outfits, and also a ton of video that I might upload at a later date. This show is seriously phenomenal. If you have a chance to see Gaga live TAKE IT. You won’t regret it. 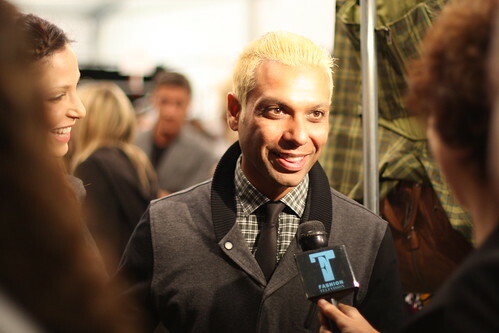 Yesterday was the first day of the CMJ music festival here in New York. I picked up my badge near Washington Square park, but skipped the press meet and greet to finish my shopping and errands. After a quick dinner, I ran over to the Music Hall of Williamsburg. It was my first time attending a show there. The venue is small, but impressive. The crowd was at capacity, but there was still room to move with out being smothered. 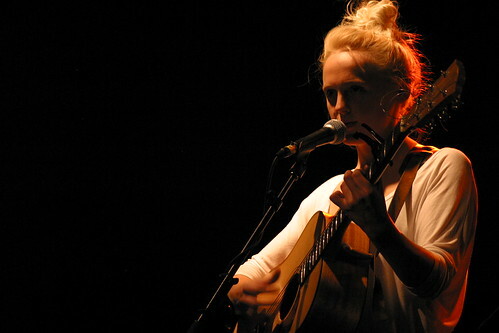 Around 9:30, Laura Marling took the stage. I wondered how Laura and her guitar (alone with just a cello player accompanying her) would be loud enough to hear over the crowd. 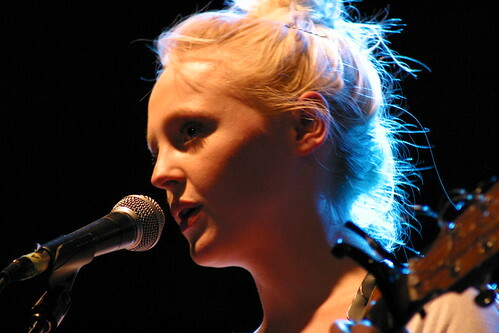 But Laura’s voice is clear and powerful, and the audience was amused by her quiet small talk. She seemed a bit shy, but very excited to be in Williamsburg, which she said is one of her favorite places on Earth. Laura’s set was short, but sweet. She played a lot of new material, which I wasn’t familiar with, mixed in with songs from her first album “Alas I Cannot Swim” (like “Ghosts”, My Manic and I”), and a few outtakes (like “No Hope in the Air” and “Blackberry Stone”). I’d been waiting what seemed like months for Laura to come to the US. After her short set last night, I’m very sorry I missed the chance to get tickets for her sold out show at the Public Theater this Friday. I wasn’t familiar with The Antlers before seeing them last night. But I can understand why they have a growing following. 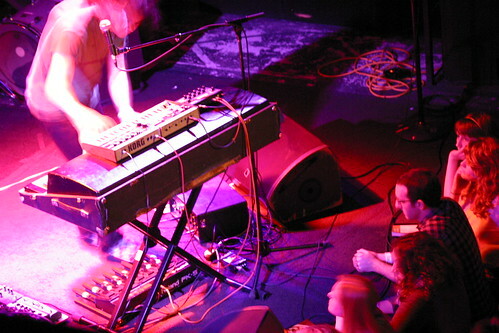 Their live show is fast, and intense for a 3 person band, and had the audience captivated. I only caught half of the show, due to not feeling very well and wanting to get home before my train stopped running. 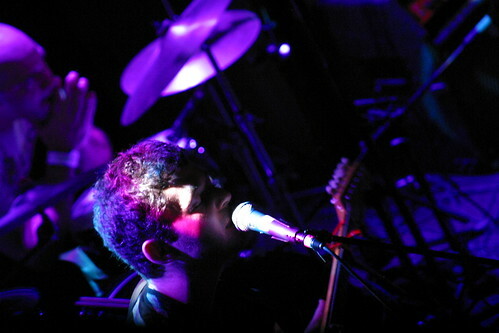 But I can definitely see The Antlers, on many “CMJ bands to watch” lists becoming even more popular in the future. Read the L magazine’s review of the entire show here. 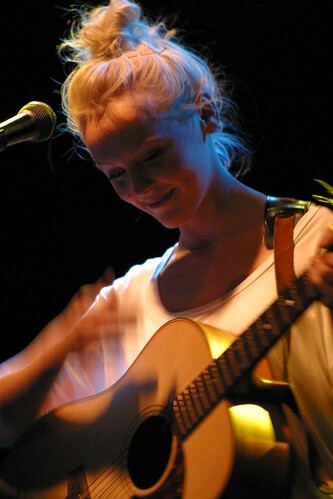 The author compares Laura to Joni Mitchell, which I couldn’t agree with more! 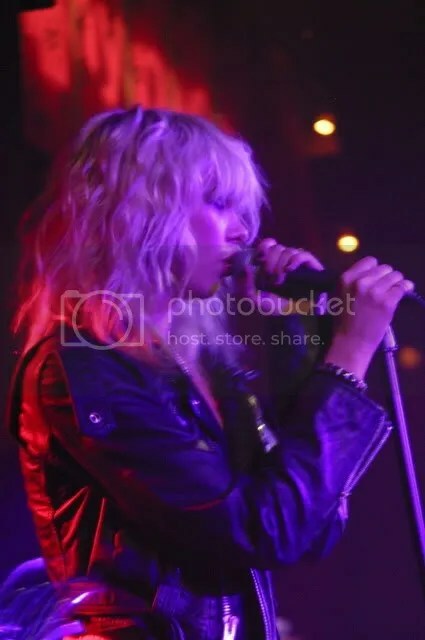 Last night I headed over to Hiro Ballroom to celebrate Taylor Momsen’s 16th Birthday, and catch her band, The Pretty Reckless, perform. The show started a bit late, so my friends Hillary, Krystle and I sat down to wait. Within 2 minutes, Ed Westwick and Jessica Szohr walked in. The VIP attendant didn’t seem to know who they were, and Ed became visibly flustered. But within a minute or two, everything was rectified and they were let upstairs. When Taylor came on stage, the crowd went wild. It was hard to even see the band, there were so many people crowding the stage, and so many hands in the air with cameras. I snapped a few pics before receiving a text from Hillary saying that the VIP area was now open and unguarded and she was “standing next to Chuck Bass”. We proceeded upstairs to meet her, and ended up standing right behind Jessica Szohr, who once again kindly posed for photos. After a few minutes, I felt a gentle push on my handbag and heard a voice say “Sorry Love”. 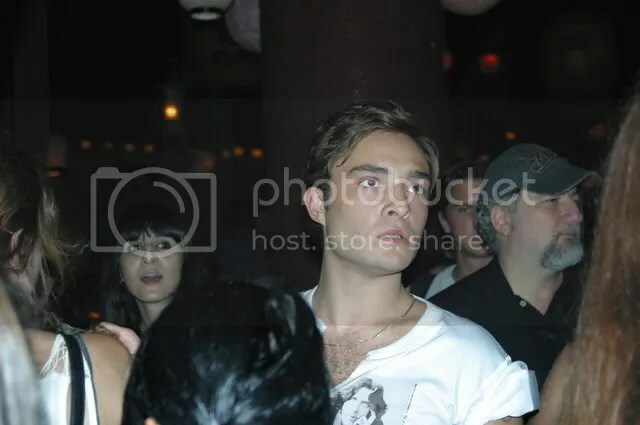 I looked up and saw Ed Westwick squeezing past me! I have to say, his accent is dreamy. I tried to play it cool, and not act star struck since we were in a public place standing three feet apart, and not on set or anything. But it was hard. He stood right in front of us for the majority of the night! The three of us watched the show, and ended up meeting Michelle Trachtenberg in the process. She seemed a little annoyed to be bothered by fans , but I don’t really blame her. It happens. 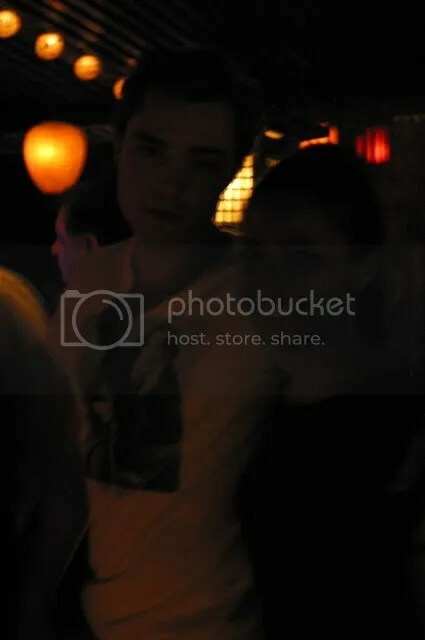 We saw Ed and Jessica chatting with friends, and kissing and acting affectionate to each other. Despite what the tabloids might say, the two are definitely still together. I asked Jessica as they were leaving if I could snap a photo of the two of them, but she said no. Ed with Hillary earlier in the night. He’s so handsome, he broke my camera flash! I think he thought I was mental, trying to fix it. He also asked who I worked for, and why I had such a large camera! After the show, Taylor appeared and was swarmed by fans! 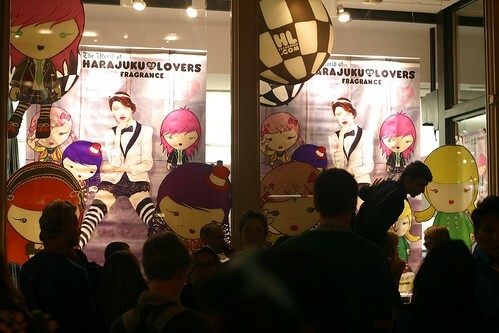 I couldn’t even life my arms to take photos, it was so crowded! Hillary and I managed to get a photo with Taylor on my disposable camera. (I would have dropped it off on my way home, but oh wait, Duane Reade no longer develops FILM./End Rant) I asked her about twitter, and she said she doesn’t have one, and suspects a friend is impersonating her! I also had her sign my copy of Page Six Magazine’s Gossip Girl issue, and talked with her about the shoot. She said it was one of the most fun she’d been on, and remembered hanging in the trailer with her mom and I! Matthew Settle was also there, and posed for some photos with Taylor. The onscreen father/daughter duo were beyond cute together in real life! We managed to snag a photo with Matthew too, who was seriously soooooooo nice. He gave us hugs, and signed my magazine as well. Twice actually, since the first time I forgot to uncap the sharpie! I told him that he and Taylor were my favorite cast members, and the best to meet in person, which really made him smile. I also spoke with a few of the other members of Pretty Reckless, who said they weren’t sure when their next show would be due to Taylor’s filming schedule. They are definitely worth checking out in the future next time they go on tour! 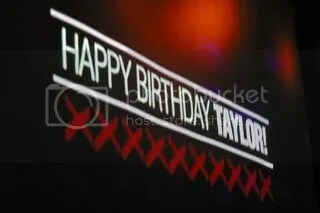 I think it was great that Taylor decided to celebrate her birthday with her friends and fans. Awesome of some of the other cast members to show up to support her too! (Chase Crawford was supposedly there, hiding. But I sadly missed him!) I’m happy for my friends as well, since they got to meet some of their favorite celebs. So cute seeing them get all excited! Tonight was my first time at Hiro Ballroom (which is gorgeous btw) and definitely a place I will be going back to in the future! More photos of Taylor and the rest of the cast after the jump! Saturday night I saw one of my FAVORITE bands ever, No Doubt, perform live for the first time in SEVEN YEARS! 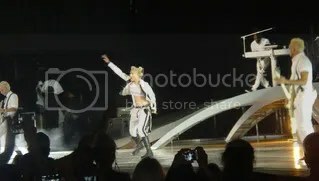 Gwen Stefani, October 2002, Chicago IL. I went to three of Gwen’s solo shows, but have really missed No Doubt. This band has had a greater impact on my life than any other band could even come close to. I’ve met some of my best friends, and my old roommates on No Doubt message boards. Traveled great distances to see them live, and even went to an aftershow party with the ND boys (minus Gwen) back in the day. I was so excited to finally see them reunited on stage in New York, that I cried. Totally embarrassing, but I couldn’t help it! My friend Veronica and I joined the tour club to get presale tickets, so we ended up ultra close in the 7th row! 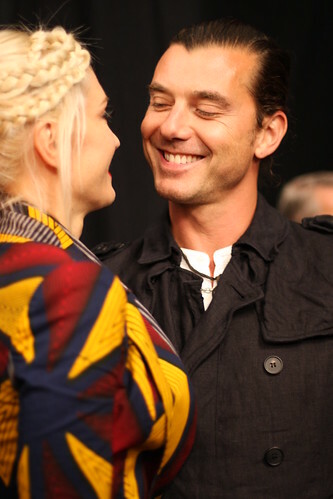 We were so close we could see Gavin and Kingston Rossdale, and later Zuma watching “mom” from the side! I also saw Ken Ehrman, from l.a.m.b their with his family, and of course Curtis, Gwen’s long time body guard walking around. The whole experience was perfect. The only way it could have possibly been any better would be if they had played my favorite song, “Artificial Sweetner”. The stage, the video backdrops, the costumes–everything was spectacular. I first saw No Doubt live when I was 14 or 15 years old! They are definitely one of those bands that only improves with age, so this time around they were absolutely breathtaking. I’m pretty sure the show was sold out.